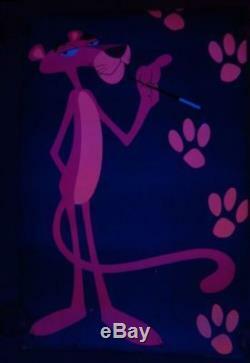 Fabulous vintage head shop poster printed in 1971 in the UK for commercial release in the US featuring a blacklight image of the famous cartoon character created by Fritz Freleng. Format : 25x38 inches (66x97 cm). Condition: Fine / Very Fine. Poster has never been folded but has had some tears at top and bottom edges + few paper pulls. Will be sent rolled in a sturdy tube. This is one of the many movie, music, comic book art and advertising/Olympic posters which can be found at ILLUSTRACTION GALLERY - ART THAT POPS! A brand new online poster gallery devoted to the celebration of the poster artists behind the art of the movie, music and comic book. We only sell Vintage and rare posters (no cheap reproductions). Specialized in art by Robert McGinnis , Ray (Raymond Elseviers), Frank McCarthy, Hans Hillmann, David O'Daniel, Todd Slater, Jack Kirby, Jim Steranko, Marvel Third Eye Black light, Rick Griffin... As well as Steve McQueen, Audrey Hepburn, Clint Eastwood, Steve McQueen, Alain Delon, Jean-Paul Belmondo, Sophia Loren, Paul Newman, Raquel Welch and many other actors and actresses and Italian fotobusta (photobusta), Japanese B2 posters, Belgian posters, French posters, Italian fotobusta (photobusta), German A1 posters, Fillmore posters, Family Dog posters, complete set of Munich 1972 Olympics posters and many more colorful images which can be discovered on the site. For larger quantities, a separate invoice will be sent. Feel free to contact the gallery for any queries/questions. ILLUSTRACTION GALLERY - Art That Pops! 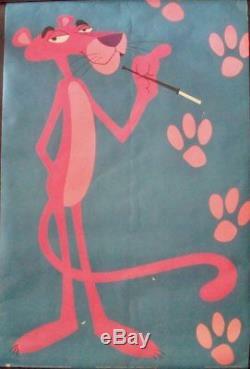 The item "PINK PANTHER Vintage 1971 Blacklight HEAD SHOP poster 25x38" is in sale since Monday, May 21, 2018. This item is in the category "Art\Art Posters".